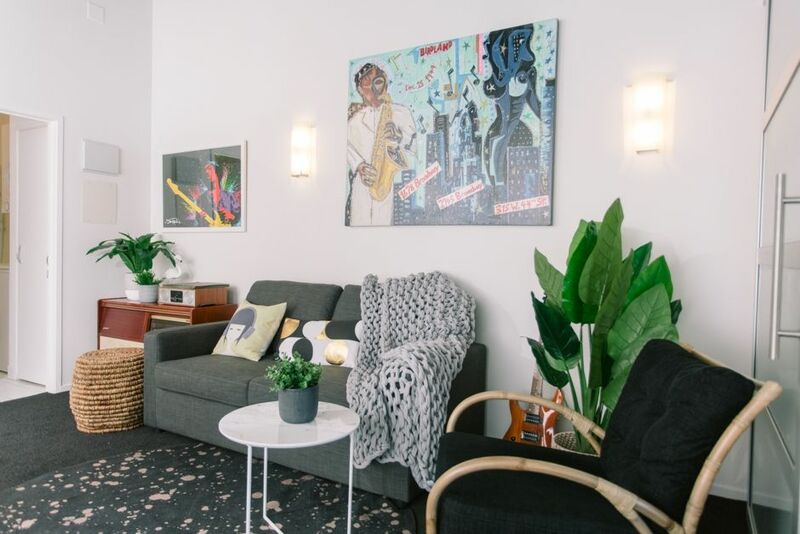 This funky two bedroom apartment has a very cool urban vibe and is the perfect place to call home for your stay in Auckland. With interior design that musos' will admire and stunning artwork, this downtown haven is the perfect inner city base. Enjoy the local neighborhood's vibrant atmosphere as you are just a short walk away from Britomart, the Viaduct, Spark Arena and some of Auckland's best places to eat and drink. Each have super comfortable pocket sprung queen beds made up with quality and professionally laundered linens to make sure that you are well rested and ready for whatever the next day brings. Enjoy the large LED Smart TV with Netflix, bluetooth audio system, free unlimited Wifi, board games and toys for the kids during your stay here. A great place to sit back, relax and enjoy the funky interior design and art work from local artist Chuck Gordo. The lounge also has a double sofa bed which is available should guests require it. The kitchen has everything that you need so that you can whip up a quick dinner or enjoy a lazy morning with breakfast in bed. There is coffee, tea, sugar, milk, cooking basics and we always leave you some tasty snacks to enjoy! If cooking isn't your thing, then venture out into the neighborhood's vibrant atmosphere and you will be just a short walk away some of Auckland's best places to eat and drink. The bathroom is modern and there is a washing machine and dryer. Amenities including shampoo, conditioner and soap & towels are all provided for guest use. We have several other apartments in the area so if this one doesn't quite suit you needs, please get in touch. We also have more apartments in this building which is great for larger groups travelling together. Parking is available for $20 per night (subject to availability) and must be booked in advance. Check-in is after 2PM. Lost keys incur $150 plus any locksmith costs. We have a strict no party policy. We are strictly non smoking and there is a $1000 fee for breaching this. Hello! We are Paul & Emily and have been HomeAway/Bookabach hosts now for nearly 10 years. We love it so much that it is now what we do full time through our business 'Towny' which provides awesome self contained apartments in Auckland City. We live in the beautiful city of Auckland - one of the worlds best cities! We were both born and bred here - Emily is from the North Shore and Paul is from the South of Auckland. We are both well travelled having lived and worked in Australia, Scotland, England and Canada. We've also been lucky enough to have visited many parts of the world including the USA, Europe, South East Asia, Central America and Africa. We are now both settled in Auckland with our two daughters Lucy (5) and Georgia (3)! We love hosting guests from all over the world and ensuring that they enjoy our wonderful city as much as we do. You may also interact with Bernadette or Emilie during your visit who are our guest experience superstars and work with us to make sure that you have a wonderful stay. Perfect location for getting around downtown Auckland. Just park the car and easy walk to Queen street, Britomart and Viaduct. The property was well appointed and suited our five family members well. We enjoyed our stay at this property. Brilliant place to stay. Clean and comfortable. Lovely small touches with welcoming us!! Great location and well set up place with everything you need. Hosts were really responsive when dealing with some issues we had with carpark access. Helpful & efficient dealing with wi fi problems . Helpful & efficient dealing with wi fi problems .. lovely apartment including welcome pack & high quality toiletries.. gr8 location .. will be returning in the future !???? My partner and I along with our friends loved this cute little apartment. My partner and I along with our friends loved this cute little apartment. It was so easy to navigate the city as there were so many bars/restaurants in walking distance along with spark arena for the concert we went to. Apartment was clean, funky, and would definitely love to stay again. Thank you!